For knife owners, collectors and clubs, AKTI is the credible source of valuable information to carry and use your knives and edged tools with confidence. We work to remove or clarify laws to allow you to use and enjoy the knives and edged tools you choose for the task at hand. Memberships are listed in the individual’s name. 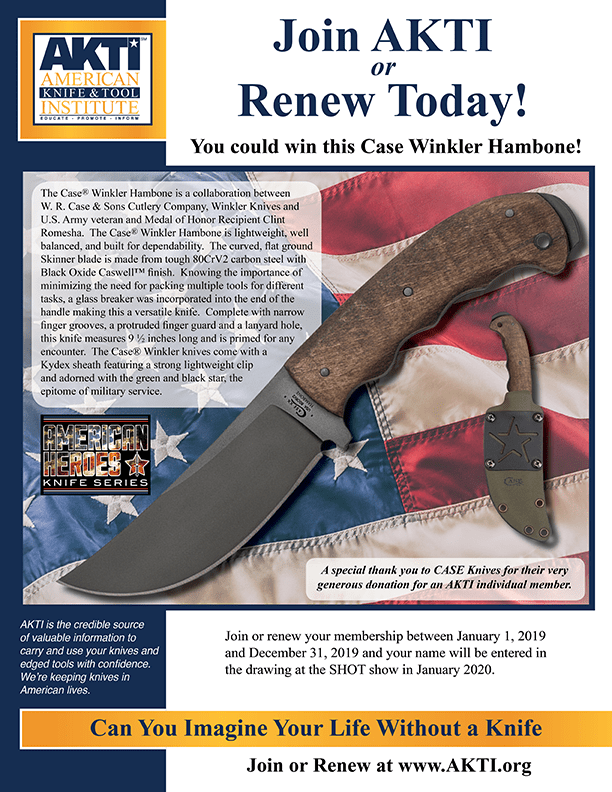 Individuals who joins or renews between January 1 and December 31, will be entered in the drawing for a knife. Drawing is held each year at the SHOT Show. The 2018 Boker Scout Knife was won by a new member from Wallkill, New York. Distinguished Ambassador receive recognition certificate suitable for framing. Life Ambassadors receive a wooden recognition plaque. For knife owners, collectors and clubs, AKTI is the organization that will increase the enjoyment and utility of your knives and edged tools. Our organization is the credible source of valuable information to carry and use your knives and edged tools with confidence.Memberships are listed in the individual’s name. Contact us if you would like to discuss payment options for Life Ambassador membership. Are You a Part of the Knife and Tool Industry? Sign up for Membership on Behalf of Your Business.